Following the success of our Noxious end of summer sales 2017, we decided to permanently drop its price to only 39 $/€! And remember, if you haven’t done so, you can get a free 30 day trial of the Noxious Rack Extension at the Propellerhead Shop. Back to work after some refreshing and inspiring summer vacations? Now’s the time to get back composing and be creative. 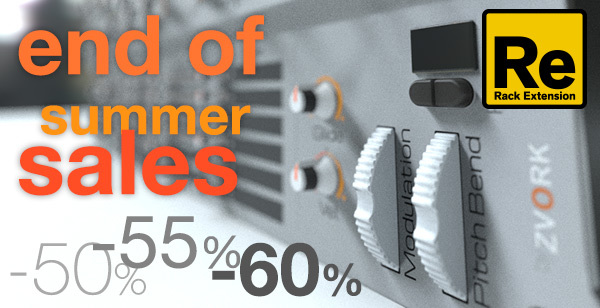 To help you out, we’ve dropped the prices of our audio rack extension lineup for Propellerhead Software’s Reason by up to 60% until september 5th!! Jump to the Propellerhead Shop until it’s too late. 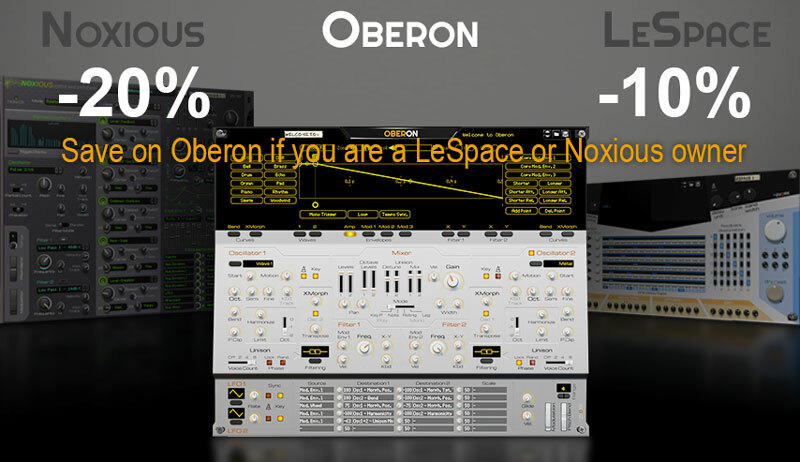 If you are a current owner of our LeSpace or Noxious Rack Extensions for Propellerhead Software​’s Reason and would like to get your hands on our latest Oberon Synthesizer, we now offer discounts! To be eligible, just send an email to contact@zvork.fr with a copy of your email receipt for LeSpace or Noxious. We will reply as quickly as possible with your voucher code. Navi Retlav Studio has just released an amazing ReFill for our Noxious Additive Wave Synthesizer. 150 new wonderful patches perfectly complete the sonic palette of the default presets, especially if you are into electronic music. If you are a Noxious user, checking out the demo is an absolute must, and for 19$, it’s a deal. A new update of Noxious is available for download. It only fixes typo error on the front panel and adds a handfull of new patches. A new minor bug fix update of Noxious is available for download. It only fixes a bug with CV output of LFO 1 & 2 but you do get a dozen more patches for your sake. 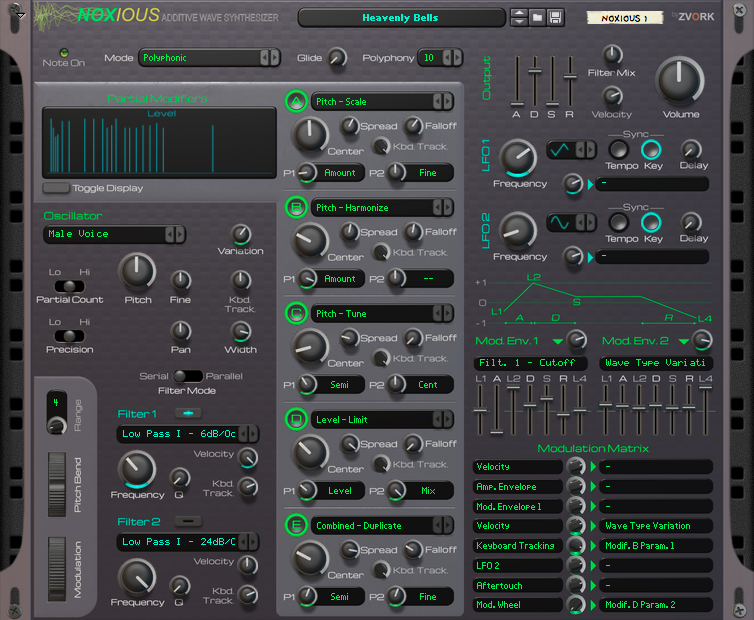 Zvork is pleased to announce the release of the latest version of its Noxious Additive Wave Synthesizer for the Propellerheads Software Rack Extension platform. This version 1.5.3 fixes some minor bugs and adds 74 new patches including signature patches from Nucleus Soundlab, authors of numerous ReFills for various Reason synthesizers. With this release comes also a one month 30% discount on Noxious to celebrate spring. Upload it for free from the Propellerhead Shop, if you already own a license. The RackExtensionReview website has reviewed Noxious with an overall rate of 4 out of 5 stars. Not bad! They liked the sound engine very much but were displeased by the UI. What do you think of it?